Paul Adkin is a writer, theatre director, actor and educator. He runs the ÑU theater companies in Madrid, Spain. Ñu Teatro www.nuteatro.com and Ñu Accents www.nuaccents.es . He is the author of plays, novels,short stories and philosophical texts. His novels "Purgatory", "Art Wars" and "When Sirens Call" can be found at any of the Amazon online stores. It was Kant who warned us of the dangers of allowing God into the equation when tackling the notion that purposiveness exists in nature. For Kant it was quite simple: using God to explain natural science is no good for either science or theology. It produces an overlapping of boundaries and that creates uncertainty in both camps. But: Why is this so? If we can deduce that the Universe seems to be fine-tuned towards the creation of life, what is wrong with attributing that fine-tuning to an omnipotent, eternal force like God? Well, our first objection is that the concept of God is by no means a neutral one. It has too much semantic baggage, and those that claim ownership of that luggage are adamant about the enlightened stand-point of their perspective. Likewise, it is hard to see religions embracing cosmological arguments as a proof of the existence of God, simply because cosmological fine-tuning is not found in the Scriptures and when seen from the scientific point-of-view, the science undermines the Scriptures or renders them unimportant. If God did fine-tune the Universe, it is very doubtful that It would be the same God who is said to have communicated with us via the prophets. Once fine-tuning, or any other scientific explanation of creation is accepted, the Scriptures no longer make any sense. So, if science explains the deterministic, fine-tuning of the Universe it cannot use the term God to describe how or what could have been involved in the process that allowed this fine-tuning to come about. Of course, what cosmological fine-tuning implies is that yes, things seem to have been designed, or that there seems to be a design embedded in the structure of the Universe, driving it towards a certain end. Whether this end is willed or desired by the Universe is not a question that can be properly answered by science, but neither is it a pertinent question for theologians who would need to try and apply fine-tuning to the scriptures or vice-versa. That would be an absurd task. The question here then becomes: If the implications of cosmological fine-tuning is a metaphysical question, who should deal with that metaphysics if it goes beyond the scope of theology and science? To answer that we must consider where metaphysics came from, and we find its origins in Greek Pre-Socratic thought; the same thinkers who gave birth to philosophy and science. Through the Pre-Socratics, and metaphysics, science and philosophy are genetically tied. The first philosophers were trying to explain the essence of reality by defining the essence of nature; this is what science does through theory and experimentation, and it is also what metaphysics does through logic. Cosmological fine-tuning is a logic-deduced concept derived from scientific data made from observations of the cosmos. It creates a metaphysical field that needs to be explored philosophically, and it implies the existence of a deterministic Universe, or an infinite Multiverse, and that suggests deep, positivistic repercussions for humanity. Cosmological fine-tuning is a controversial subject for science, as are all deterministic ideas. Physics and mathematics might tell us that the nature of the Universe is incredibly precise and that, without this minute precision in its structure, the Universe would have been incapable of evolving as it did, but this also implies that we are the results of such an incredibly precise mechanism that the least likely explanation is that the cosmos was a beautiful accident exploding out of the Big Bang. And this makes theologists clap their hands and scientists blush. To save themselves from the theologians, scientists have come up with an equally speculative idea that our Universe is not a real singularity and we should talk of a Multiverse made up of an infinite possibility of universes. Quantum physics has opened the door to the realm of the speculative and allows, if not demands, very creative thinking. In a way it has pushed cosmology back into the area of philosophy again – especially towards the primal area of the Pre-Socratics. Scientists are now daring to think within the dangerous space of infinity and recently even sacred concepts like time, the Big Bang and Thermal Death have been questioned. If philosophy is focussed on necessity, and if our necessity is rooted in the survival and permanence of the sapiens species, our humanity, then the positivism inherent in purposiveness has to be embraced, and the fine-tuned cosmos has to be interpreted as a positivistic inspiration for humanity. The Universe has allowed the conditions for life to be created and evolve into a creature that is aware enough to perceive and to try and understand the very nature of its own creator. And if we permit our own destruction, we are threatening the destruction of all perception of the Universe as well … This is philosophy as positive incentive, as a rediscovery of humanity as a vital force within the cosmos. If we want to survive as a species and evolve as sapiens, then we must embrace concepts like permanence and progress as virtues. But permanence and progress together. Progress seen as that which will create valuable things that can endure. Endurance is what we see when we marvel at the pyramids or when we tackle the classics in literature, or stand before the great masterpieces of art and music. But the value of endurance must not be limited to conservative sentiments that lead to decadence, rather, endurance can only be guaranteed through progress as human and sapiens concept. In order for reality to exist it needed to create an object/subject capable of perceiving it, but in order to do that, it had to firstly manufacture a physical space for that perceiving-subject to evolve in. This needed to be constructed in such a way that life could evolve within it. The problem is analogous to our relationship with our computers. If we can imagine things from the computer’s point of view … well, from the perspective of an AI computer that would be capable of having a point of view …For that AI consciousness, reality is out of the box that the physical universe is contained in. Nevertheless, something in that same out-of-the-box reality is responsible for programming the operating system that allows the AI to exist, be conscious of its existence, and even be capable of understanding its own condition as an artificial form of reality created in order to understand the real. Even though that reality is outside of the box and hence alien to the AI’s own immediate environment. A question arises from this: Could an artificial intelligence ever come to really understand that which it’s been designed to do without being able to leave the box and experience the authentically real for itself? In fact, this dilemma seems to be a moot point, having been made irrelevant by the fact that an intelligent computer does have access to input from outside. Actually, the imagined world of the Cyberentity would be mostly formed by its perception of the information that it could gather from the Internet, which would be information about the other reality, outside of the box, that is our world. So, here the analogy breaks down, or does it? Here, perhaps, Plato was right. Everything that exists in the physical world has been created from information uploaded into it from the pre-physical or transcendentally Real dimension. Or perhaps not … Could our physical reality have been a different kind of computer to the ones we are accustomed to be using? Imagine that we want to build a device that could actually teach us about ourselves by clearly revealing to ourselves what we are from a purely objective stand-point. Our main aim therefore, would be to fabricate something which would provide an objective perception of us and, at the same time, be able to communicate its impartial perception of us to us, in a language that we are capable of understanding. 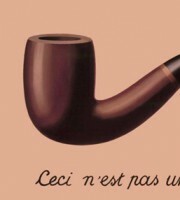 It might be considered that the best way to do this would be not to invent a super-AI observer of us, who could teach us, like a Messiah (we already know how flawed that process is), but rather to fabricate a virtual, but distorted image of a civilisation, that we could observe from a safe and impartially-perfect distance. If the civilisation were flawed we could learn from its mistakes, if it were perfect and Utopian, we would have a model to learn how to improve our own societies from. In order to make this didactic universe, we would need to programme an environment capable of evolving in its own original way, but in a direction in which the creation of perception, consciousness, self-consciousness and curiosity were all possible. At the same time, the process would need to be monitored by us, so that, the internal language of the organisms evolving in the process can be learned and understood by us. Only if we allow a language of evolution that’s alien to our own, and therefore objective because distorted image of ourselves will the experiment provide scientifically important results (a mirror-image of ourselves would not give us the distance needed to truly learn from our observations of it). Only if we are constantly monitoring the language in order to understand its idiosyncrasies will we be able to draw purposeful conclusions and enjoy a meaningful experience from the experiment. The fact that it is conceivable that we, or an Artificial Intelligence, could be capable of conducting such an experiment, opens a mind-boggling window into the question of reality. In fact, the very existence of virtual-reality questions the nature of our own perceived-world in exactly the same way that Plato did. We are not only capable of imagining the creation of a virtual universe, the purpose of which would be to understand our own being, we could also very well be the results of such a fabrication by an entity outside of our own box. It also tells us that consciousness of the virtual does not have to be a nightmarish experience, like the one depicted in the Matrix films, but rather it provides a purposeful meaning for our existence in terms of the entire multiverse – in and out of the box experience of Reality. If the scenario we have imagined here is correct, and we are the virtual creations of the universe, then it means that we are the objects that the universe learns from, which turns us into the didactic material that the universe absorbs. And the moral lesson this teaches, is that the essence of the universe is moulded by our example and that is a tremendous responsibility. Yet, if this is so, what needs to be done? Perhaps the best way to solve this question will be to create our own virtual-universe laboratory … and by doing so extend reality further into the infinite regressions of the multiverse. Infinity is a reality, but it is found not in expansion but in regression. The effect cannot be the cause of its cause (Kant) – but the result can be an inspiration for beginning the process of its own creation. This causal nexus is true of anything that is created from an idea, or all things which are the products of visionaries. The cause of the thing comes from the fact that it has been imagined (nexus of ideal causes). In many cases, if there had not been an imagining of the result the initiative to create it would never have taken place. And so, in our technological reality, cause and result are closely intertwined, because most inventions are imagined and made to satisfy a perceived need: forks came about from an idea of the need to save our fingers from getting sticky when we ate. But how does this help any metaphysical understanding? Can we apply this idea to the question of the first cause? Can intuition be enough to create something out of nothing? How can this relationship exist without a mind to start the creative process? For it to be possible the nothing has to be capable of intuiting something, which would imply that the nothing would possess awareness; and this suggests that the nothing is not nothing at all but awareness, which is something; even though, in the beginning it would be an awareness of nothing, which is a very poor form of consciousness indeed. Of course, next to nothing, any something is everything, so in the long run this intuition of something has limitless scope. The dilemma might point us in the direction of the idea of God (before anything there was an eternal thingy that made everything out of itself); or perhaps we could assert that the primordial God is awareness (omnipresent in everything that is aware). Likewise, it brings up the concept of determinism (Awareness blending into purposeful Will), and also suggests a way of envisaging a purposeful universe without the necessity for God (unless a religion can be made in which God actually does become Awareness). Through intuition of a nexus finalis, in which entities-with-awareness (sapiens life-forms) are able to fully know the Universe in one great act of love (Being through knowing and being known, as well as appreciating and preserving what is known), a determined future opens up for us. An idea which can have enormous practical benefits for humanity, because it positions us in a purposeful place within the evolution of everything (the Universe). But perhaps you think this is a pointless argument: that we are trying to prove the unproveable. In fact, we are not trying to “prove” anything: what we are aiming at is a pragmatical solution to the insalubrious effects of nihilisms; to wrestle with the ingrained pessimism that is debilitating humanity. Why do people prefer the non-purposeful over the purposeful? Part of the blame for this must be heaped on the religions, for they dogmatise the purposeful universe and distort it in order to drive purpose in the direction of the interests of power. If purpose is a tool for power, then many will reject it. The irony of this is that even the resultant nihilism has itself become a tool for that power, especially now that power nurtures itself via an economic system of anarchic capitalism. For this system, purpose is too directional itself and offers too much clarity for the system which requires relativity in order to mask its real purposes. Purpose is therefore a threat to the system that can only be tolerated by allowing it to be projected through the distorting glass of religion. In this way, we can see that there is nothing more radical in this world than real purposiveness; by which we mean the examination of a non-theological, cosmological, nexus finalis direction to the Universe. Progress does not come about through cause and effect alone, but only through effect-driven causes inspired by purposive ideas. The Universe is the effect-driven result of the condition of nothing that allows for the possibility of everything. But our Universe is also a refined everything, stabilised through the filter of intuitive purposiveness. A purposiveness which is denied by the global money-driven civilisation we have now created, propelling us into a chaos of pessimisms and cynicisms regarding our own humanity. To find harmony in our lives, we need to harmonise our way of living with the same intuitive purposiveness possessed by the universe; we need to open our eyes and see where we are all going; where our ancestors will be at the end of time; and imagine what they will emerge as when the final evolution eventually takes place. If we accept the deterministic conclusion implied by Cosmological Fine Tuningthat our physical universe is geared towards the creation of life and that this creation of life is the purposive aim of a purposive Universe, then the next question to be asked is – Why is this so? The Idealist reasoning of existence, that the subject only exists when there is an object to perceive it, suggests that existence itself is the aim of this cosmological plan. If the Universe is purposive, then there is a reason behind evolution. A deterministic development of the Universe, driven to develop sapiens life forms, would indicate that the cosmos desires more than mere existence itself, it needs to be perceived and known in a state that we call Authentic Being. What is the purpose of being known? How could knowledge, via these sapiens entities, be a necessary element in the cosmos? Perhaps these particular questions are irrelevant within the cosmological plan, nevertheless, they are essential for any desire to establish deep human purposiveness and combat nihilism. A school of study and debate on these questions and the purposiveness enshrouded in Authentic Being could create more human progress in ten years than capitalist ideology has managed in five hundred years. Human purposiveness can only truly be appreciated once we examine the role of life in the Universe. Why is the Universe here? Why are we here? Once we have accepted these queries as valid concerns for all of humanity, we will start to see the authentic purposiveness in our art and technology, and the retarding effects of our economy. In logic, antinomy is the term used to describe a “real or mutual incompatibility of two terms”. It could be regarded as a synonym of paradox. The statement “there is no absolute truth,” is antinomic because the statement declares a truth that it also claims to be impossible. Likewise, the concept of Fake news is an antinomic entity, if we consider news to be reports of what has actually happened, and, therefore, inherently true. Antinomy is not only resolved when its conflicting propositions are found to be not in in fact contradictory, it is also seen to be one of the more profound insights into the apparently contradictory structures of truth. These conflicting propositions are capable of existing together, although in a way that, as Kant says: “transcends our faculties of cognition”. Likewise, we have discovered how often conflict can be resolved by finding the middle way between them, and this middle way also possesses a certain transcendental quality that, when applied to the conflict, can take hold of these two antagonistic forces and, through its own possession of qualities in both of them, resolve their otherwise internecine obliteration of each other. Between the objective opinion and the objective judgement comes cultural taste, which is an opinion formed from a combination of objective study and personal feelings towards things. As such, we have taste standing between opinion and judgement, transcending the negative qualities of both. For Kant, the judgement of taste has its determining ground: “in the concept of what may be regarded as the supersensible substance of humanity.” In Jungian terms, we could say that taste is powered by archetypes which, if they are nurtured, will pull the subjective into the realm of the human, allowing for humane judgements that equally transcend the cold calculations of purely objective meaning. And yet, in terms of the human and universal, there is hardly anything more untrustworthy than taste. But: how can a thing that is so untrustworthy be the harmonising agent of reason? And, what are the consequences of this untrustworthiness of taste? To answer these questions, we need to examine how ideology uses taste to perpetuate itself. Here, perhaps, a viral analogy can be used: The viruses of ideologies insert themselves into the cells of taste in order to propagate themselves throughout the System. And as ideology is a divisor and anti-human force, the harmonising and humanising potential of taste is constantly mitigated. Yet, it remains our only hope – and for this reason taste must be cared for and cultured towards the human, away from the ideological. It is ideological taste which perpetuates the social and environmental antagonisms we are faced with today. Refinement of tastes is, therefore, a humanising process concerned with universals and archetypes; with what connects us to each other and to the world, rather than what separates us. Taste is a mixture of both the aesthetic and the rational. The aesthetic is intuitive by nature, the rational is analytic, and taste is intuitive and analytic at the same time. It is in this combination of intuition and analysis that makes taste so important. But in order to be effective as humanising agent, it needs to be carefully refined. Perhaps there can be no more important labour for humanity than this refinement of our personal tastes. A universal taste, for example, is one that still believes in good and beauty, but good and beauty themselves are universal and ideal concepts. For this reason, and in order to anchor the ideal in a coherent world-view, it is necessary to see the Universe as a purposive thing. It is only through this anti-nihilistic world-view that human progress is possible. Within our economy-obsessed System, progress is taken away from the domain of the human and invested completely in the realm of the economy under the guise of growth. But growth is not progress, because growth in the economy is always quantitative and never qualitative, whilst human progress must always be seen as an improvement in the quality of life for all human beings. Aesthetic and moral concepts are purposive things. Things we are striving to make; discover; be: and all of them carry a sense of improvement in them. The purposiveness of taste is both realist and idealist: the real is a process we are necessarily moving through before the ideal can ever be realised or attained, or, perhaps, even discovered. Accident is part of the real, but it is the real that makes the accidental possible. In order for taste to become something of worth again, we need to anchor it to the ideals of universal purposiveness in order for real to move at last in a purposeful direction. We are not advocating snobbism here, but a humanising process. Snobberies divide and are anti-human because of that. Refining our tastes towards appreciating what we all have is common and the archetypal forces that direct our collective subconscious has nothing to do with snobbery at all. What we are talking about lies closer to religion, but religion without ideology – and religion is now infested with ideology. The basic principles of education must be entrenched in some idea related to the broadening of the students’ minds. If we see education as a way of pulling society away from ignorance and we consider it to be a fundamental ingredient in what it is that makes us human, then the broadening of the mind is also a vital part of what it is to be human. Likewise, this broadening of minds can also be seen as good for human societies and important, and therefore desirable and moral. A narrowing of minds is therefore bad. When we see the media (mainstream and social) expressing an obsession for local scandals, or we see schools and universities concentrating in specialised areas of learning that often breed patriotic points of view at the expense of the universal, these practices are mind-narrowing and, as such, bad. Broadening is an opening up and forward-directional process for humanity. It has a teleological reading in the idea of Becoming and, even though this ideal end-cause will never be achieved, it is, in the sense of being teleological, anti-nihilistic. That which is concerned with its opposite, the narrowing of minds and the localisation of experiences as well as the obsession with the dictates of personal taste in opposition to universal laws, is nihilistic, anti-human, and dangerous. All good, and therefore all true morality is inextricably linked with necessity. The more necessary something is the better it is. A good meal, for example, is good because (A) it serves its basic purpose (the eradication of a feeling of hunger); (B) it provides us with the vitamins and minerals our body needs to function, and (C) it brings us pleasure, and pleasure inspires us to keep living and to keep exploring life. Health requires balance and the art of gastronomy is also geared toward creating harmony. All necessity is related to life and all good is related to the harmony needed in order to preserve life and the inspire the purposiveness of life. We all have our reasons for doing things, but what is our purpose? What is the purpose of anything? What is the purpose of the whole? If we analyse purpose, we can discover the beauty of the thing. The beautiful is inspirational: it inspires purposeful activity – searching, discovery, creation and imitation of that which is purposeful and beautiful. It is through beauty that we find the purposiveness of pleasures. All art is a searching for and a working within the purposes of pleasures. The capitalist system needs an accelerated rhythm of growth to function, but that pace is unsustainable for a healthy planet. Fully aware of this dichotomy, the same system creates the terms: sustainable growth and ecological sustainability. The basic idea contained in both concepts is that capitalism’s requirement for infinite growth can be achieved through the concept of sustainability, i.e., the exploitation still goes on, but in a way that doesn’t completely exhaust the resources without first allowing nature to replenish those reserves. Daly’s idea was presented in 1993 and it caught on: or at least his terms captured the imaginations of the politicians who love to be given new altruistic terms to bandy about, but they have taken little no interest in what Daly meant by that change in terms. Now sustainable development is used as a synonym of sustainable growth rather than an alternative to it, as no one at administration levels in the developed world seem to be challenging the virtues of growth itself. It is impossible for capitalism to relinquish the idea of growth, for that would mean betraying the fundamentals of its own ideology, but calling it development doesn’t make the problems of growth go away. However, what is clear when we contemplate Daly’s paper, more than 25 years after he submitted it, is that capitalism has had a profound need for legitimising growth, and it has been absolutely aware of the inherent absurdity buried within its own ideology for decades. Growth is impossible and absurd, and that means capitalism is impossible and absurd. Growth is profoundly dangerous, and that means that capitalism is profoundly dangerous. The capitalist argument pitches nature as an enemy of freedom, and this is obviously another false premise of its ideology. Freedom for the capitalist of course, means freedom to accumulate wealth. For the poverty-stricken, working but anti-socialist classes who support the freedom ideal of capitalism, the growth-freedom idea offers them the illusion of being able to get to the top of the pile themselves. In fact, an economics of un-growth has far more chance of closing the vast gap between rich and poor and hence create a feeling of empowering the poorer classes. An empowering that would itself engender a greater sensation of freedom. The principle of the goodness and necessity of economic growth is not a valid one. All necessity rests on the eradication of all ideologies of growth. We cannot afford to keep toying with the capricious whims of those who have engendered and who perpetuate the capitalist lie. It must be judged in a fair trial, and a verdict must be reached. Of course, the case is so strong against the unsustainability of growth that its advocates will feel that a fair trial is impossible, but that is no reason not to pounce on the assassin who is holding the smoking gun. Did I say pounce on them? Well, in this case the murderer owns the police force and the press, so: who will make the arrest? That is our real dilemma. Philosophers from Plato to Nietzsche have often extolled the virtues of the spirit of war against the weak and cowardly condition fostered by perpetual peace. Kant went so far as to call war ‘sublime’, and one of the most sublime eulogies of the warlike spirit was uttered by Orson Welles in the famous cuckoo-clock speech in The Third Man. In that film, Welles wrote his character’s own monologue in which he compares the cultural achievements of the war-torn and strife-riddled Renaissance in Italy with the lack of accomplishments born from two centuries of peace in Switzerland. Welles’ argument is that war created Botticelli, Da Vinci and Michelangelo while the best thing that peace has come up with is the cuckoo-clock. Nevertheless, the comparison is a false one: it is not ’peace’ but the mediocrity created by an emphasis on conservative values and the commercial spirit that makes Switzerland culturally insipid. Switzerland is an economy of clocks, but also of banks. And banks that have made themselves very rich through the wars in other countries. Yes, the vulgarity of our economic lives in peace could be seen as a spiritual travesty, but that is not the fault of peace. It is consumerism, not peace, that deadens our own spirit with its vulgar want-more will. What is bad in our societies is the lust we have for acquisitions, not our endeavours to live in harmony together. Capitalist harmony is always based on competition which is a war in itself. A nihilistic competitiveness that has made us spiritually and creatively numb, and breeds more depression than exultation. Money inhibits creativity and ends up suffocating it. What we have to learn is how to see the great sublimity in our own human creations. Our power to create must always be more sublime than our will to win by defeating and destroying. For humanity there can be no greater flaw than our tendency for war and the ease with which internecine conflicts start. War, an instrument for profit and a way of producing and expanding power by maintaining and escalating the capitalist system, has now lost any moral ground that it may once have seemingly possessed. Moral reasons have always been fabricated to justify the needs for wars, and governments will continue to falsify such reasons to dupe the public with flag-waving patriotisms. Without the false-morality, war is impossible in democratic societies. But, in order for war to disappear, peace has to be elevated to a much higher moral pedestal. It is ‘peace’ that needs to be considered sublime, not war. The first casualty of any declaration of war is peace; the two concepts cannot coexist. If there is a little war somewhere, then peace does not exist. Contrary to popular belief and a lot of philosophical ranting, peace is not a static state but a dynamic one. For peace to exist it needs to be sublimely creative, and it needs to transcend the false façades of peace created by consumerism and capitalism, which are their own kinds of wars. Only through peace can purposeful dynamics be nurtured. Only through peace can truly creative progressive incentives, liberated from the distractions of conflicts, properly deal with the world’s most pressing problems – poverty, famine, violence, oppression, the climate emergency, and … war.